The Good News – You are a Child of God. 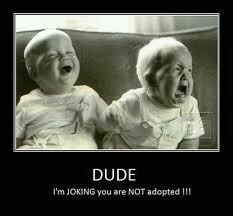 The Bad News – You Were Adopted?! In my many blog discussions and debates over spirit birth, I have learned that spirit adoption is the preferred theory of those who do not like the idea of literal spirit birth. The idea of adoption as the fundamental relationship between God and man does not appeal to me in the least. And I would like to attempt to explain why that is. But first it may be a good idea to provide simple definitions for spirit birth and spirit adoption as I currently understand the terms. Joseph Smith’s teaching that something about us (intelligence/mind/spirit) has an eternal past, and was never created nor made, is a remarkable thing with many implications on Mormon theology. One of the obvious results of such a teaching is that it ultimately eliminates the creator/creature relationship between God and man. But with the creator/creature relationship eliminated, what then is the relationship between God and man? In one week my presentation will be over, and perhaps I will be able to think about something else. That might be nice. In a recent thread at BCC, J. Stapley apparently felt the need to argue my presentation before it is even given. This is probably no big deal since we have been over this stuff often, and I am sure that I will not be presenting anything that will be a big surprise to anybody. In the comments to this thread I stated that Dr. David Paulsen and I seemed to be on the same page with much of this topic. Matt W. said that he read the same section of ‘Mormonism in Dialogue with Contemporary Christian Theologies‘ and did not come away with the same impression. I am pleased to pass along what I feel are the relevant statements from this section of the book. I have been thinking of reviewing this section in the Ensign while it lasts. I hope the Ensign continues this department. This review comes from the January 2010 issue, and I will try to catch up as the year goes on. I will mostly just cut and paste what I feel are key points and open it up for discussion if anyone is interested. This particular article addresses the topic I am preparing my presentation for so it particularly caught my attention. You can read this very short article by clicking the link above and then clicking on the ‘What we Believe’ bookmark on the side of this PDF file. SMPT Paper on Spirit Birth ….. ACCEPTED! I just received word that my paper on Spirit Birth for the Society for Mormon Philosophy and Theology was accepted. I am pretty darn excited about it. Now what?! 1 – I do not want to be buried alive by people at this conference. I am not very sophisticated or well read in philosophy. There will be plenty of people who could bury me alive if they chose to. YIKES! 2 – I suppose I will have to spring for a flight, a motel, a rental car, etc. Cha-ching. 3 – I just don’t know what to expect. Do I just read the thing and ask for questions? What goes on at these things?? Anyway, I guess I need to write a 200-300 word abstract, and figure out what a ‘curriculm vitae’ is. And I want to thank everyone who helped me with this. That includes everyone who ever interacted with me on any of my goofy spirit birth posts and comments, but particularly those who encouraged me and gave advice in my posted outline and draft. The idea of mankind being the children of God is not a new one. Yet, many take this idea metaphorically. One of the unique aspects of Mormonism is found in how literally many members take the parent/child relationship between God and man, and how many members take this relationship literally.